Balabolka is an efficient Text-To-Speech (TTS) program that is able to use and support all the installed computer voices on your system. You can save the on-screen text as MP3, MP4, WAV, OGG or WMA files. This software is able to read clipboard content and view text from various file formats, such as CHM, DjVu, HTML, LIT, MOBI, ODT, DOC, AZW, AZW3, EPUB, FB2, PRC, PDF and RTF files. Additionally, you can change background color and customize fonts. 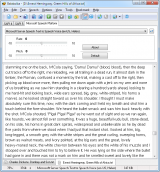 The reading process can be controlled by using the global keys or from the system tray. Balabolka uses the Microsoft Speech API (SAPI and lets you modify voice parameters, such as pitch and rate. You may also improve the voice's articulation by applying special substitution lists. Balabolka allows you to save the synced text in MP3 tags or in external LRC files. This will display the text when an audio file is played on modern digital audio players. Balabolka is a multilingual application and supports a wide variety of languages, including Romanian, Russian, Serbian, English, Arabic, Bulgarian, Czech, Dutch, Finnish, Japanese, Korean, Persian, Chinese (Simplified and Traditional), Croatian, Polish, Portuguese, Turkish, Ukrainian, Slovenian, Spanish, Vietnamese, Greek, Hungarian, French, German, and Italian. It supports the majority of spell-checkers. It's unable to read some abbreviations. Learning to use all its features may be time consuming. Balabolka has been tested by Download82.com team against viruses, spyware, adware, trojan, backdoors and was found to be 100% clean. Our editors will recheck this software periodically to assure that it remains clean.